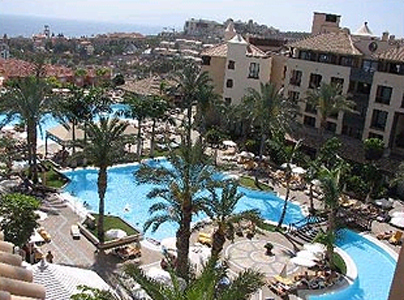 Costa Adeje Gran Hotel Tenerife Island Adeje Tenerife, Hotel Spain. Limited Time Offer! Of a LuxuryRead more category, the Costa Adeje Gran Hotel Tenerife Island has all the comforts such as : Restaurant, Room Service, Free Parking.Located south-west, 7 minutes by car distance from the city center, this hotel at Avda. Bruselas 16, Costa Adeje is the ideal pied-à-terre to take advantage of all the wonders of Adeje, whether for a few days or for a longer stay.Relax yourself in the hotel's spa & health center.This hotel offers a unique service : conference facilities.This hotel is part of the Global Reservations chain.For those going to the airport, Tenerife Sur is 11 miles from the hotel which is about 34 minutes by car.Practical information:This hotel has a free parking. It is situated at BRUSELAS 4-6 in the west section of El Roque, at only 20 minutes by car distance from the center.Of a Budget category, the Riu Adeje has all the comforts such as : n.a..